Traditional architecture has always known how to build according to climatic conditions in a particular location. As mere examples, we traditionally use sloped roofs where it snows or highly ventilated houses where is humid and hot. In this sense, in the traditional architecture of dry and hot places, the inner courtyard is an element that helps not only tempering the climatic condition inside the courtyard but also improving the comfort conditions into the building. It is commonly accepted in the popular knowledge that courtyards are cooler than the outside in hot summer, and that the use of vegetation or water, as in the traditional patios in the Mediterranean climate, make them fresher. 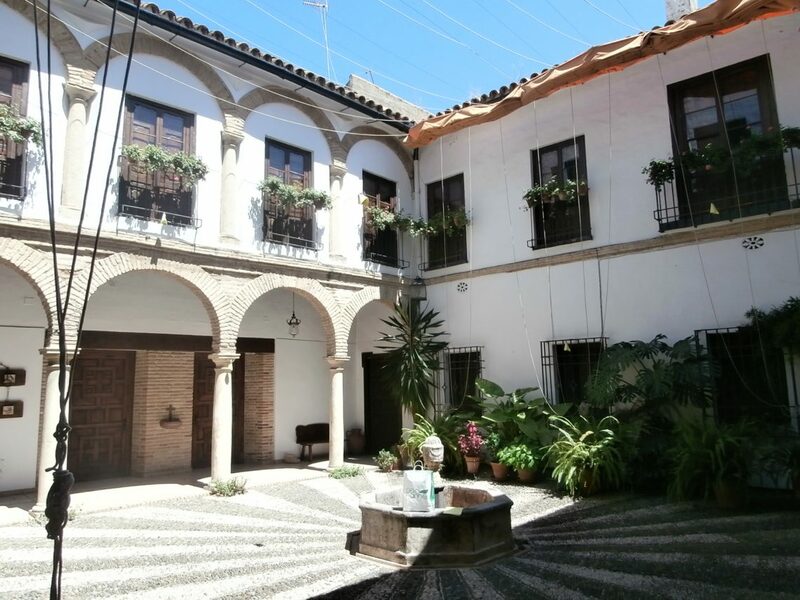 In fact, in Córdoba (South of Spain), our studies have monitored a reduction up to 8ºC of the outside temperature inside the courtyard of a traditional house. This microclimate generated in the courtyard also reduces the energy consumption of the building. However, modern architecture seems to have forgotten the benefits of designing according to the climatic conditions or fails into incorporating their benefits among the current requirements of buildings. If we were able to design buildings following this passive strategy, we could reduce the total energy spent by the building sector, contributing to the sustainable development of our society. The research developed as part of the project MORE PATIO “Eco-Efficient Design of Courtyards by means of Reduced Order Modelling” analyzes these spaces in different buildings in order to understand their performance. This is essential to being able to design new buildings with optimized courtyards as a passive element to save energy. The thermodynamic effect such as stratification, convection, and flow patterns explain the performance of the courtyard. Stratification: When the walls of the courtyard have a lower temperature than the air, this is cooled and goes down. This movement displaces warmer air to higher levels. The result is that the air inside the courtyards is distributed in layers according to its temperature. Convection: If the walls have a higher temperature, because of the effect of solar radiation, the air in contact with them will be warmed and goes up, creating a convection effect that will make the cool air go down in the middle of the courtyard. Flow patterns: Air currents inside the courtyard induced by the wind can have a key influence in its performance. These currents are affected by the geometry of the courtyard, particularly by the aspect ratio, which is the relation between its depth and width. These effects can be affected by many other factors such as the geometry of the courtyard, the presence of vegetation or water, or wind, among others. Therefore, it could be difficult to predict the final performance of a building. We have found that many of the available tools that already exist are not able to simulate the microclimate inside the courtyard and even consider them as a negative element to their energy performance due to the general belief that a compact building is more efficient than a porous one. The research we are doing has the goal of developing a tool for architects that help them design these courtyards: a simulation software that can be used during design stages to achieve the best performance given the boundaries conditions of a specific project. However, the first step in this process is evaluating the existing tools in order to know their usability for the designer and the accuracy of the results. To achieve this accuracy, all the available software are based on CFD to calculate the complex Navier-Stokes equations. We found ANSYS Fluent, IES.VE, Design Builder and ENVI-met as the most used ones. In this paper , we evaluate the performance of ENVI-met given that is a specific software to simulate microclimates in the urban scale but its performance in the specific case of the courtyard has not been sufficiently assessed. In order to prove the accuracy of the software, an important part of the research is the monitoring and data analysis from different courtyards. The collected data is contrasted to the simulations to test their accuracy. In the study, three different courtyards in the city of Sevilla, in the Mediterranean climate, have been monitored and simulated. Although the obtained results showed a reduction in the air temperature of the courtyard, when contrasting these results to monitored data, ENVI-met simulations were less accurate as the courtyard size decreased. In general, the results were not accurate enough to be considered a good input to energy efficiency calculations in buildings. The difference between outdoor temperature and inside the courtyard is too important in these calculations to have a big difference between them. Furthermore, the computational power needed to each one of the simulations and its lack of flexibility when modeling reduces the usability of the software. For that reason, we concluded that ENVI-met is not a satisfactory tool to be used in the design process of these kinds of spaces when trying to assess their energy efficiency. Another aspect that we must consider, and is an objective in our current research, is the possibility of simulating other elements apart from geometry, such as elements that provide shadow, vegetation, and water. Our monitoring showed that a shading element can duplicate the reduction in air temperatures inside the courtyards at peak hours (when outer temperatures are around 45ºC). This adds complexity to the tool that we want to develop in order to get the desired flexibility and accuracy when designing energy-efficient buildings. The potential future effects of global climate change are among others, a warmer climate. In a warmer future, enclosed open spaces such as inner courtyards can provide cooler places to live and reduce the energy requirements of a building. This demands new, passive design solutions. These findings are described in the article entitled Courtyard microclimate ENVI-met outputs deviation from the experimental data, recently published in the journal Building and Environment. This work was conducted by V.P. López-Cabeza, C. Galán-Marín, C. Rivera-Gómez, and J. Roa-Fernández from the Universidad de Sevilla. C. Galán-Marín currently works at the Construcciones Arquitectónicas, Universidad de Sevilla. C. does research in Civil Engineering, Architectural Engineering and Materials Engineering. Victoria is a Master in Design Studies candidate 2020 (Energy and Environment concertation) at Harvard Graduate School of Design, granted by Fulbright Scholarship and Harvard Real Colegio Complutense Scholarship. She holds a Major in Architecture and a Master in Education from the University of Seville, Spain.